James Mattis will leave the Department of Defense on Feb. 28 after two years of service as DoD’s top civilian leader. 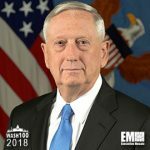 “My views on treating allies with respect and also being clear-eyed about both malign actors and strategic competitors are strongly held and informed by over four decades of immersion in these issues,” Mattis wrote in his resignation letter dated Thursday. His four-decade military career included time as head of U.S. Central Command, U.S. Joint Forces Command and NATO’s Supreme Allied Command for Transformation. He also served as commanding general of Marine Corps Combat Development Command and executive secretary to the defense secretary. Mattis, a two-time Wash100 winner, is a former Davies Family Distinguished Visiting Fellow at Stanford University’s Hoover Institution.